Washington, D.C. — Every year, the White House holds a White House Correspondents Dinner. It invites the press and a broad sampling of celebrities to enjoy a glamorous, black-tie party where the president performs a stand-up comedy routine. It is an opportunity for people to pretend that the American head of state is not guilty of a wide variety of high-level crimes. While this year’s dinner was no different, President Barack Obama employed a special form of comedy. 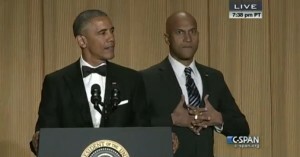 He was aided by comedian Keegan Michael Key of Comedy Central’s “Key & Peele.” Playing a character named Luther, Key acted as Obama’s “anger translator.” He took Obama’s “politically correct” statements and translated them to tell the press how the president really feels. …despite our differences, we count on the press to shed light on the most important issues of the day. Luther “translated” this into an accurate joke about Fox News fear-mongering (“And we can count on Fox News to terrify old white people with some nonsense!…”). Protecting our democracy is more important than ever. For example, the Supreme Court ruled that the donor who gave Ted Cruz 6 million dollars was just exercising free speech. Obama, who earlier in his talk joked about politicians who take money from the Koch Brothers, has himself enjoyed astronomical sums of money from hegemonic industries, from the banking cartels to weapons manufacturers. But he wouldn’t dare joke about that. Instead, he went on to quip about everything from CNN’s coverage of the Ebola virus to Hillary Clinton and climate change. He danced around any semblance of accountability for his contributions to the corruption of the entire Washington establishment. The biggest insult of the “Anger Translator” sketch, however, is the underlying presumption that Barack Obama has something to be angry about. He has successfully convinced his support base that he has been antagonized, sabotaged, misrepresented and impeded by lawmakers who do not respect his authority and hate him for unfounded reasons. While there are many members of Congress who irrationally loathe him, the reality is that he has perpetuated war, violence, privacy violations and corporatism as much as any president before him. If anyone should be angry, it is the American people and those around the world who have suffered because of his policies. None of this was discussed. Investigative journalism; explanatory journalism; journalism that exposes corruption and injustice and gives a voice to the different, the marginalized, the voiceless—that’s power. It’s a privilege. It’s as important to America’s trajectory—to our values, our ideals—than anything that we could do in elected office. Once again, he completely ignored his active role in suppressing that press and failed to mention that the United States has slipped in its free press ranking during his time in office. He glossed over the fact that as the president who once preached transparency, he has actively kept information from the people—from domestic surveillance to hisdisposition matrix (kill list)—all while intimidating journalists from reporting on his crimes. Unfortunately, the greatest implication of Obama’s black-tie event is the ease with which he is able to avoid discussing his very serious shortcomings and misconduct. Using his smooth delivery and celebrity presence (amplified by his close ties to celebrities and Hollywood power brokers), the president is in a morbid position to joke about the state of the country when he is squarely responsible for the dire problems he finds so comical. Rather than question him, the press has praised him—highlighting the fundamental problem of having galas for the journalists who are tasked with keeping politicians accountable.